This is the 40th anniversary re-issue of the legendary 1959 LP. First time ever on CD in an exclusive arrangement with the Stanyan Music group. Comes with bonus tracks plus the exclusive Beatsville picture font on CD. This coffee-fueled tribute to/parody of then-contemporary Beat culture has stood the test of time and serves as an authentic peek through the keyhole of American bohemian culture of the 1950's. 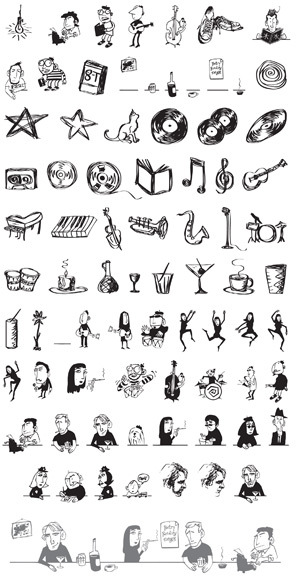 The Beatsville dingbat font included on the disc features 72 illustrations. If one were to jump into the way back machine with its dials set to the 1950s, they would come across a lot of things. Sputnik was flying, Chuck Berry was wailing, and “conformists” (regular folk), along with much of the mainstream media, was making fun of Beatniks. 50s Beat poets and scenesters were no different than other subculture-following bohemian types that had come before and would come after them; their circle was filled with innovators, pretenders, and self-critics. Enter Rod McKuen, the cat with a thousand zingers for his beatnik brethren. This reissue of Mckuen’s second album (as well as many bonus tracks) marks the 40th anniversery of its original release. Pieces like “Haiku Poems” and “Back to Sausalito” will definitely please those in an introspective mood. Mckuen’s easy flowing vocals are carried into the conciousness by jazzy/pop instrumentals. 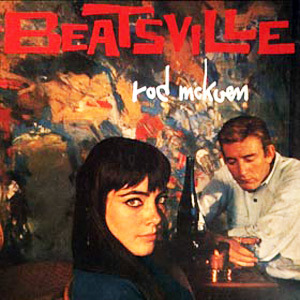 There’s not enough that can be said for this disc or Rod Mckuen’s dignified narrative genius. Blast this loud on your way down to the co-existence bagel shop, and everything will feel fine. ...Beatsville is such a valuable document. McKuen's madcap and poignant verses, carefully crafted to amuse both the locals and the slumming hoi polloi, have more truth in them than any attempt at a just-the-facts-ma'am reportage... Rod McKuen. Too earthy for the hippies. Too honest for his own good. Poet. Gentleman. Millionaire. Teenaged disc-jockey. Orphan. World-class character. Genius? He's strong, but he likes roses. He's not afraid to appear ridiculous, and he doesn't. But the kids who laugh at him look faintly absurd now, don't they?